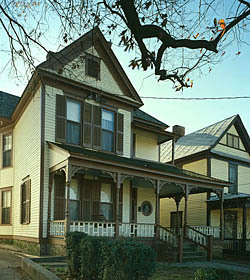 Martin Luther King, Jr., birth home at 501 Auburn Ave. This traditionally black neighborhood of several blocks in Atlanta includes Martin Luther King, Jr.'s birth home, the Ebenezer Baptist Church where he was a pastor, and his gravesite. Martin Luther King, Jr., was the nation's most prominent leader in the 20th-century struggle for civil rights. Born in 1929, he excelled as a student and graduated from Atlanta's Morehouse College in 1948. Also in 1948 he was ordained at the Ebenezer Baptist Church. Following his ordination, he became Assistant Pastor of Ebenezer. He later studied at the Crozer Theological Seminary in Pennsylvania, then graduate studies at the University of Boston. In 1954, King became the pastor of the Dexter Avenue Baptist Church in Montgomery, Alabama. Following Rosa Parks' refusal to move to the back of a bus in Montgomery, Martin Luther King, Jr., led the successful Montgomery Bus Boycott from 1955 to 1956 (381 days). In 1957 he was elected president of the Southern Christian Leadership Conference (SCLC), an organization formed to provide new leadership for the now burgeoning civil rights movement. He moved back to Atlanta in 1960 and was co-pastor with his father at the Ebenezer Baptist Church while still President of the SCLC. Martin Luther King, Jr., worked tirelessly to assure the passage of the Civil Rights Act of 1964 and the Voting Rights Act of 1965. He was arrested 30 times for his participation in civil rights activities and delivered some of the most famous speeches of the 20th century including his speech at the March on Washington in 1963, his acceptance speech of the Nobel Peace Prize, his last sermon at Ebenezer Baptist Church, and his final "Mountaintop" speech in Memphis. King was assassinated in 1968 in Memphis, Tennessee, where he was helping striking sanitation workers. Martin Luther King, Jr., was born in a two-story Queen Anne style house at 501 Auburn Avenue, in a neighborhood known as Sweet Auburn. The house has a one-story partial front and side porch with scroll cut woodwork trim, two porthole windows, a shingled gabled end, and a side bay. The porch sits on an enclosed brick foundation. Dr. King was born in an upstairs middle room on January 15, 1929 and lived here until 1941. 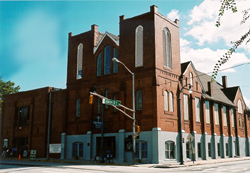 The Ebenezer Baptist Church, where for eight years he shared the pulpit with his father, is a short walk away at the corner of Auburn Avenue and Jackson Street. It is a three-story red brick building detailed in stone and has several groupings of stained glass windows. Construction of the church began in 1914 and was completed in 1922. Across from the church at 449 Auburn is the Martin Luther King, Jr., Center for Nonviolent Social Change, Inc., which continues King's legacy and work. King's gravesite occupies most of the cleared lot east of the Ebenezer Baptist Church to Boulevard Street. In 1976 a memorial park was installed around the marble crypt. The park consists primarily of a brick and concrete plaza with arch-covered walkway and chapel partially surrounding a reflecting pool. In the center of the pool, on a raised pedestal rests the King crypt. On it is engraved the inscription: "Rev. Martin Luther King, Jr. 1929-1968, 'Free at last, free at last, thank God almighty, I'm free at last." This National Historic Landmark historic district is also featured in our We Shall Overcome: Historic Places of the Civil Rights Movement travel itinerary. The Martin Luther King, Jr., National Historic Site, administered by the National Park Service, includes King's birth home, church and grave. The National Park Service's Visitor Center, at 450 Auburn Ave. features exhibits about Dr. Martin Luther King, Jr., and the Civil Rights movement. The park is open daily from 9:00am to 5:00pm; from Memorial Day weekend to Labor Day open until 6:00 pm; closed Thanksgiving Day, December 25, and January 1. Call 404-331-5190, or visit the website for more information. The surrounding almost 70-acre Martin Luther King, Jr., National Historic Site and Preservation District includes the Sweet Auburn Historic District.